Our RCG awards night is Wednesday, November 14th at 6:30. Dine at Pearl Street that evening to help raise money for the band. Let’s fill Pearl Street with our band family! Please join us by participating in this quick fundraiser to support HSE HS Band. Look for the brochures and collection envelope to come home soon! 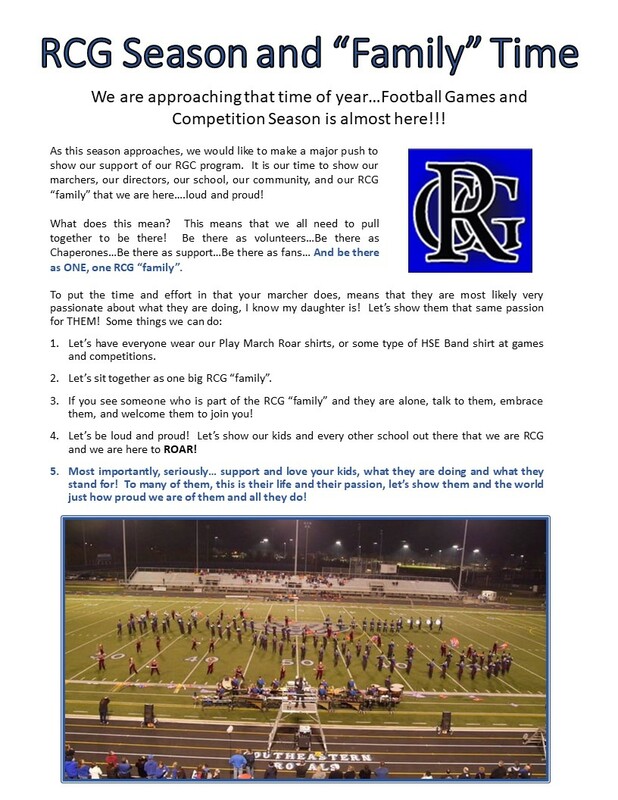 RCG Junior High Night is September 7, 2018! Please open the PDF document to learn about the fundraiser. Thank you for helping HSE HS Bands raise money for our program needs! Each day, you need to provide your own lunch from 12-1 and dinner sometime during the break around 4:00-5:30. Typically, we have an activity planned from about 4:00-4:45, and then dinner until 5:30. Our AWESOME band parents have provided an option to purchase and pre-order a couple of lunches during the week to make things easy. See the newsletter for info about that. 8am-Noon- ONLY Juniors and Seniors that have NOT yet been fitted for a uniform need to come in during this time. 8am-Noon- ONLY Freshmen and Sophomores that have NOT yet been fitted for a uniform need to come in during this time. 8am-Noon- Anyone else that needs to be fitted for a uniform needs to come in during this time; Pep Band and Leadership will need to perform for Royal Rumble around 11:30am. 1pm-8pm- EVERYONE rehearsal(Provide your own dinner 4:30-5:30pm) We will also have our PARENT PREVIEW this night at 7:00pm!! *Make sure you are staying active this week in preparation for our hard work next week! *You will want to eat well and HYDRATE, HYDRATE, HYDRATE!!! (You MUST eat a healthy breakfast before we start each morning and stay away from sugary drinks!) Make sure you bring a large, refillable water jug with you EVERY DAY to rehearsal. You will need some way to attach this to yourself at ALL REHEARSALS. Some students like to wear fanny packs. Some just use a string or ribbon to tie it around themselves or wear it around their neck. *You will need sidewalk chalk to mark your drill sets on the pavement as well. *You will also need a binder with sheet protectors to keep your drill and music for the entire season. *You will need sunscreen, a hat, sunglasses, light-colored loose-fitting clothing, and bug spray. *Students are NOT ALLOWED to leave campus during meal or break times FOR ANY REASON, due to liability concerns. We need to know where our students are at all times! *To be early is to be on time, to be on time is to be late, and to be late is completely unacceptable, so please ensure that your ride has you arriving at school NO LATER than 8:45am to be prepared for rehearsal and outside ready to START REHEARSAL right at 9:00am. Walking out to the parking lot at 9:00am means that you are late. Being more efficient with our time this year involves us having all of our equipment and being ready to start rehearsal on time each day. Thank you for being proactive in this regard and making our band better! Getting pumped to see everyone next week and get this season off to a fantastic start!!! Parent volunteers are vital to a successful Marching Band season. Without parent volunteers, MANY activities can not happen, including competitions, football games, etc. You can volunteer to be a committee lead or jump in and help with the pit crew (moving instruments on and off the field), it’s totally up to what interests you. REMINDER! In order for any Band Parent to volunteer for the 2018 Marching Band Season, a current Background Check MUST be on file with the HSE schools. Visit the http://www.hse.k12.in.us/ADM/parents/volunteering.aspx for information. Earn $ This Summer for Your Student's Band Account! Do you want to earn money for your student’s band account? Do you enjoy good music? RCG has the opportunity to work events at the Ruoff Home Mortgage Music Center…aka…Klipsch Music Center…aka..Verizon Music Center…aka…Deer Creek Music Center. Please open the PDF below for more information. If you are interested in volunteering this summer, you will be required to attend one of the service trainings. Trainings are available April 28th, and May 4th, 5th or 6th. Please sign up via Sign Up Genius. Link is attached! If you have additional questions, contact Dan Coursen at dan_coursen@yahoo.com.